Another year means another Passover Seder. Well, that’s not entirely true. Since Yuki is about 2 weeks from her due date we decided that it’s not a good idea to spend the holiday with my family. Being 3 hours from our OB/GYN at this point isn’t the best thing we could do (or at least that’s what we tell my family!). What makes it easier is the fact that I’m not a religious man by any stretch of the imagination. So, if I missed another recital of the 4 questions or the 4 sons or Elijah I wouldn’t lose any sleep. I do, however, love a good matzo ball soup and brisket. 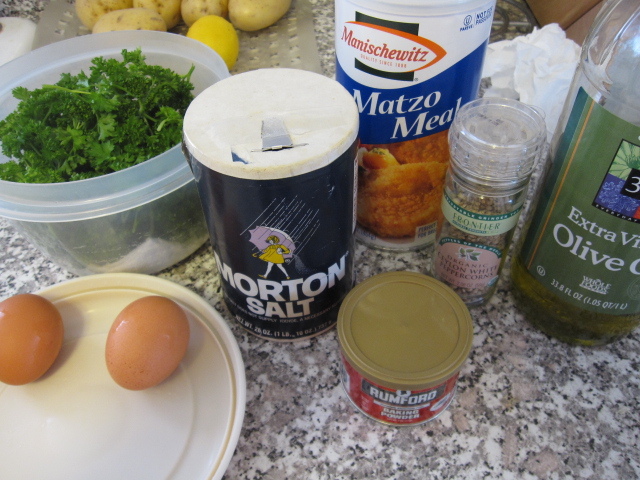 I decided that I would make a few of the traditional Passover delicacies for the first night. My younger bro also lives in Chicago and did not go to the Quad Cities, so he came over for dinner last night. 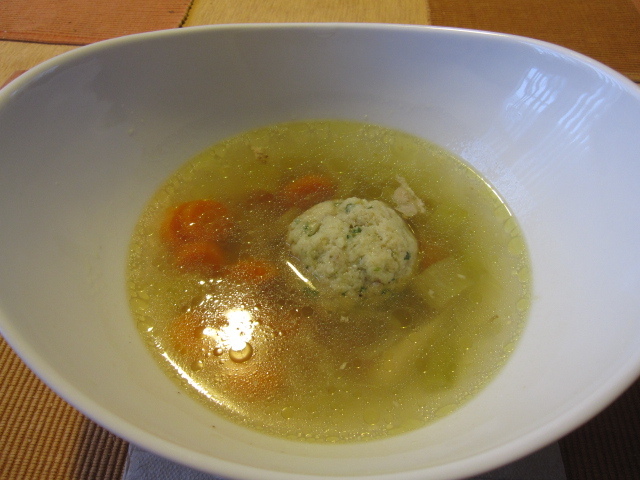 To keep with tradition, I started the dinner off with some matzo ball soup. You can ask Alpana Singh my thoughts on the perfect matzo ball. I made my typical chicken soup on Sunday and then put it in the fridge overnight. In the afternoon I took it out and let it come to room temperature. About 20 minutes before my brother got here I made the matzo balls. 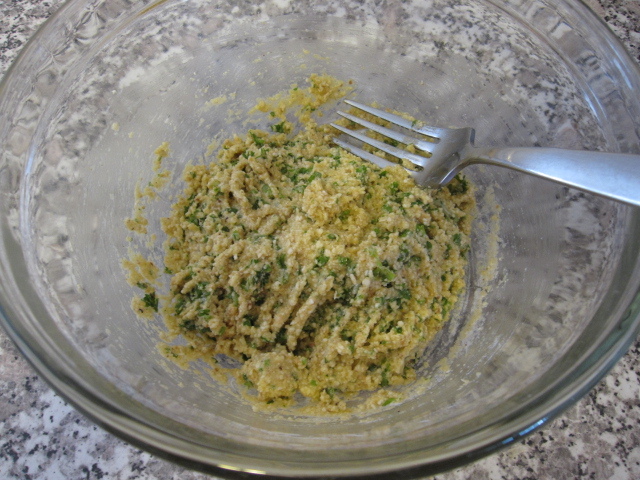 I used 2 eggs, about 3 tablespoons of chopped parsley, 1/2 teaspoon of salt, 1/2 teaspoon of baking powder, 1/2 cup of matzo meal, a few cracks of white pepper, and 1 tablespoon of olive oil. In a small glass dish I mixed together all of the dry ingredients. In a seperate bowl I beat the eggs with the olive oil and parsley. Then, I poured the egg mixture into the dry mix until it was evenly mixed. I covered it in plastic wrap and let it sit in the fridge for about 15 minutes. With the soup boiling I took the mix out of the fridge, wet my hands, and dropped walnut-sized balls into the soup. I let them boil for about 20 minutes to make sure they cooked through. That’s all there is to it, soup is ready. 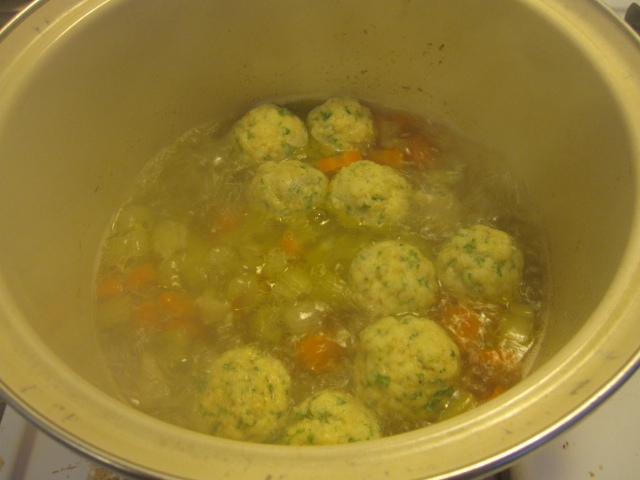 I will say that these were by far the best matzo balls I’ve ever made, and some of the best I’ve ever eaten as well. 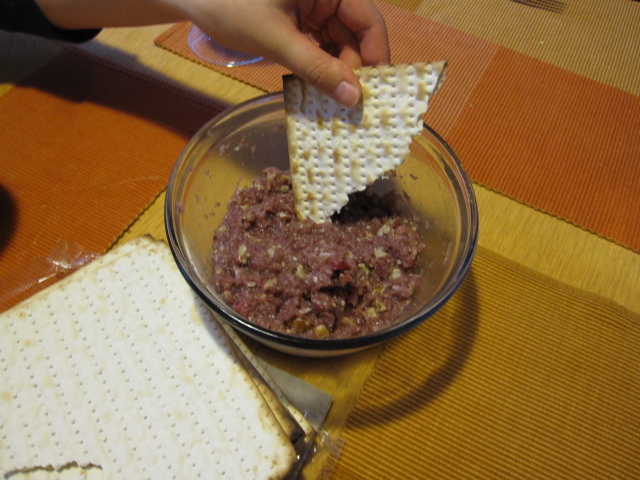 While the rest of dinner was heating up I brought out some charoset and matzo. Side note, everything we ate was prepared ahead of time so that all I had to do was re-heat for dinner. For the charoset I used 1 gala apple, 1/3 cup of walnuts, 1 tablespoon of red wine, 2 tablespoons of honey, and a few dashes of cinnamon which didn’t make it into the pic. 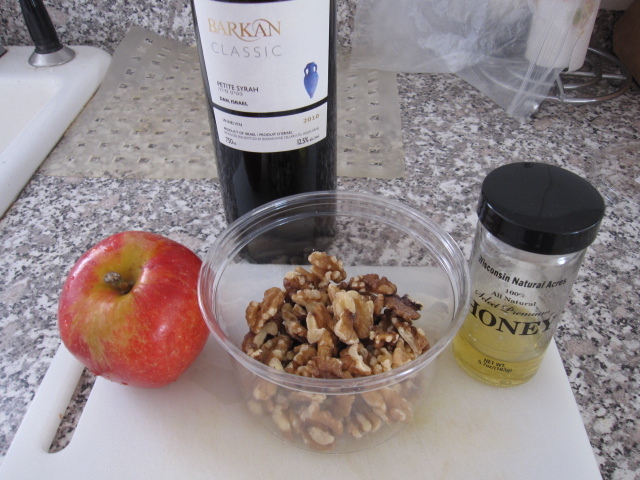 In a bowl I crushed the walnuts into small chunks then poured the wine and honey in. Then I grated the apple into the bowl, seasoned with the cinnamon, mixed it up real well, covered with plastic, and let it sit in the fridge for at least an hour. 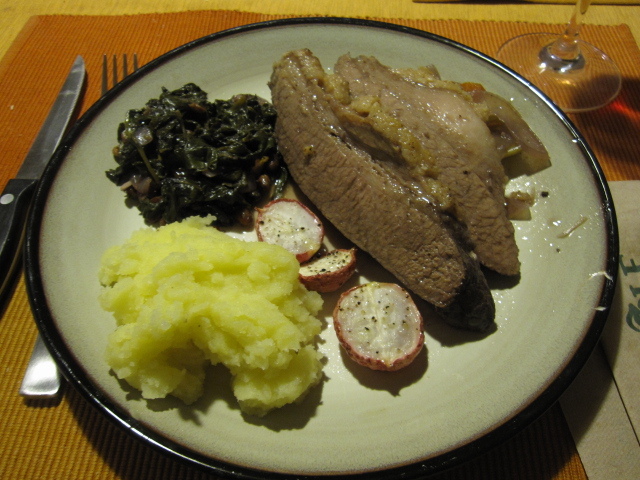 For the entrée I made a horseradish brisket (the recipe was adapted from a Gail Simmons recipe), wilted spinach with raisins and toasted soy nuts, olive oil mashed potatoes, and roasted radishes. I made the brisket in the morning to make sure it got enough time in the braising liquid. 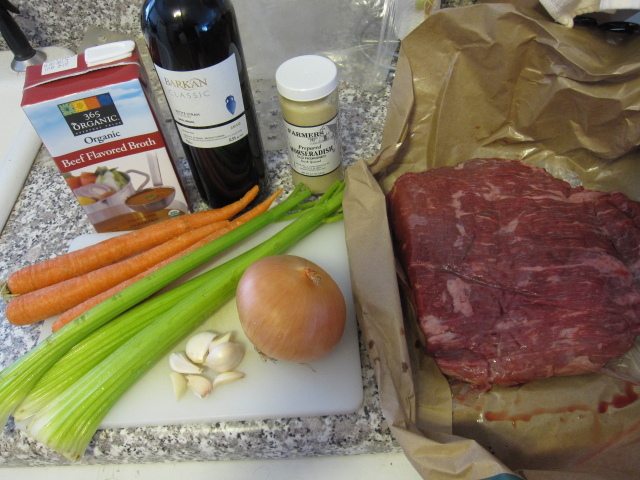 I used 2 cups of beef stock, 1 cup of red wine, 1/2 cup of prepared horseradish, 3 carrots chopped, 3 celery stalks chopped, 7 garlic cloves minced, 1 small onion sliced, and a 3.5 pound brisket. 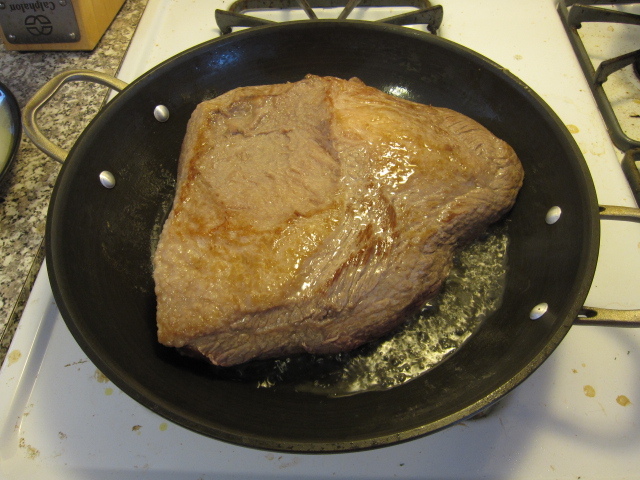 In a large heated skillet I poured in a couple of tablespoons of vegetable oil and browned the brisket. I gave each side about 7 minutes. 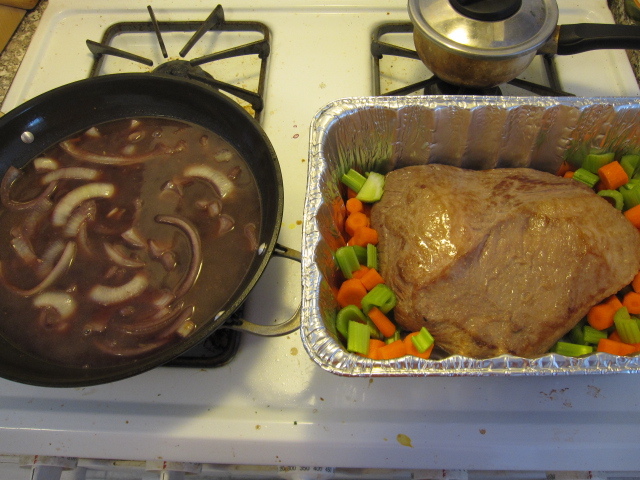 Then I transferred the brisket to a foil braising pan and scattered the carrots and celery around it. In the hot skillet I added half of the garlic and the onions and let them sweat down for about 6 minutes. Then I poured in the wine. I let the wine boil down for about 7 minutes and added the beef stock. When the liquid came back to a boil I poured everything around the brisket. I mixed together the rest of the garlic with the horseradish and spread that on top of the brisket. I covered it tightly with foil and put it into a 300 degree oven for about 3 hours. The one thing I did forget was bay leaves. I would have liked 2 of them in there. Oh well, still tasted great. After 3 hours I let it sit for the rest of the day. 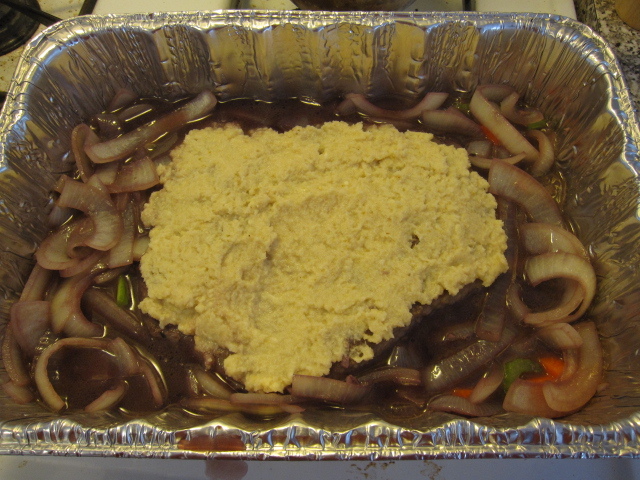 While we were eating the soup I removed the foil, seasoned with salt and pepper, and put it under the broiler for about 30 minutes or so to not only re-heat, but also to give the horseradish a nice crust. To serve I just lay a couple sliced on top of the onion, carrots, and celery. 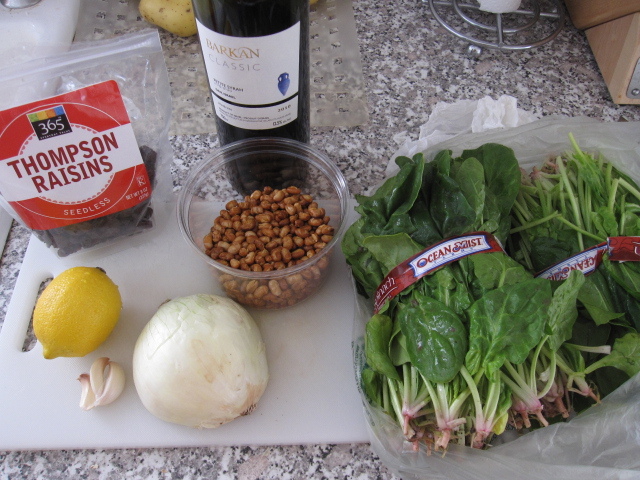 For the spinach I used 1/4 cup of raisins, the zest and juice from 1 lemon, 3 garlic cloves minced, 1/2 onion diced, 1/4 cup of toasted soy nuts (this dish would typically use pine nuts, but at $24 a pound I found the soy nuts price of $3 a pound a little easier to digest), 1/4 cup of red wine, and 2 bunches of spinach chopped. First I poured the wine into a bowl and soaked the raisins for at least 15 minutes. Then, I heated up a large pot and poured in 1 tablespoon of olive oil and sweat down the garlic and onion for about 5 minutes. Handful by handful I added the spinach until it was all wilted down. I poured in the wine and raisins. Once the wine had boiled down for a few minutes I added the lemon juice and zest. I stirred that all in and then added the soy nuts. 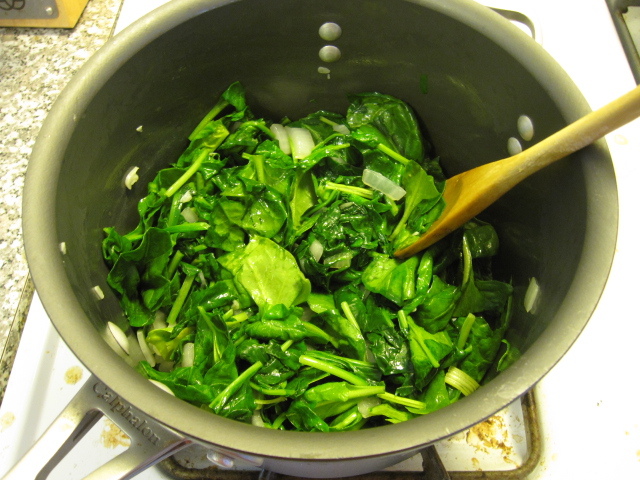 A touch of salt and pepper and the spinach was ready to go. I skinned 5 yukon gold potatoes for the mashed potatoes. Since the laws of the Kashrut don’t allow dairy to be eaten alongside meat I decided to use olive oil in order to try to make them creamy. I know, I don’t believe any of that crap, but since I was making a pretty traditional meal I thought I’d keep with tradition (all kosher wine as well). 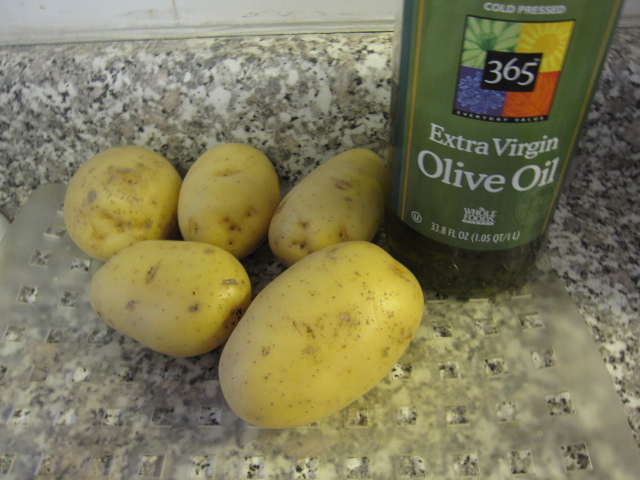 After boiling the potatoes I mashed them with about 1/4 cup or so of olive oil. Actually, I probably used more, I just kept adding it until the potatoes were the right consistancy. A little salt and pepper and they were all set. 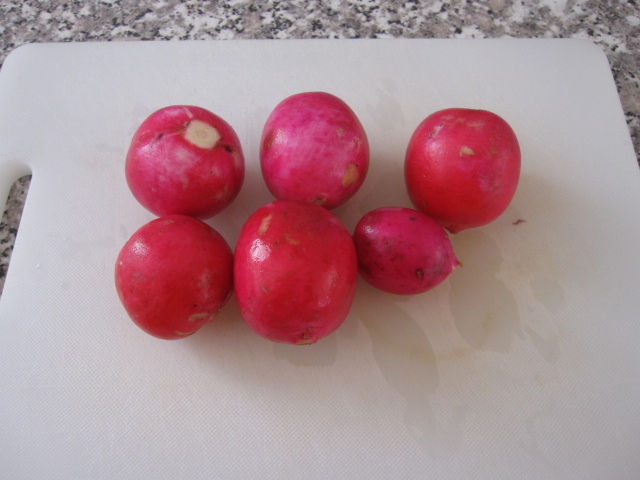 For the radishes I simply halved them and roasted them with olive oil, salt, and pepper at 400 degrees for about 25 minutes. I did not have enough time to make any dessert last night. We were pretty full anyway, but a little dessert is always a nice thing. I guess life could be worse than not having dry, matzo meal cakes sit in your stomach on top of brisket. Plus, you’re all probably tired of this post by now anyway. Happy holidays! Your mommy still makes the best matzoh balls. And they aren’t supposed to have parsley in them! I know that lots of people put it in but I think it makes them look diseased – or moldy. Fresh and vibrant! Not diseased or moldy.